PRESIDENT Edgar Lungu has directed the Ministry of Health to ensure that it provides an ambulance and new mortuary equipment to Zimba Mission Hospital by July this year to help improve health service delivery in the district. And President Lungu has directed Zesco management to provide power to the health institution throughout district so that health personnel could continue discharging their duties well as load-shedding had affected their operations. President Lungu said Government recognised the critical role the Pilgrim Wesleyan Church played in the health and education sectors in supplementing Government’s efforts to provide quality service to the people. He was speaking in Zimba yesterday when he commissioned the four newly constructed buildings consisting of the antenatal and maternity ward, radiology, the outpatient department and the lab. President Lungu said the commissioning of the four buildings will improve access to health services among the people in the new district. He said the development was a demonstration of the cordial relationship that existed between Government and the Pilgrim Wesleyan church. 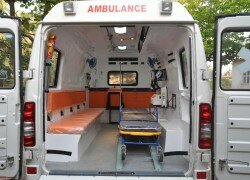 “I direct the Ministry of Health to ensure that Zimba Mission Hospital has an ambulance by June this year. I am told that the mortuary also needs equipment and am directing you to equip the mortuary. “I am also told that one of the major challenges that the hospital is facing is power and am directing Zesco to make sure that this hospital has power throughout so that it can operate well,” President Lungu said. He said Government would continue to provide support in the health sector to ensure that services were brought closer to the community. “With the commissioning of these four buildings, the people of Zimba will have access to services provided by Zimba Mission Hospital. What we are witnessing today is the realisation of the church’s role in supplementing Government’s efforts in providing health care services. “These services are a testimony of the partnership that exists between the Pilgrim Wesleyan Church and Government in providing health care to our people so as to improve their well-being,” he said. And speaking at the same event PWC bishop Alfred Kalembo thanked Government for its support to the health institutions and the schools that the church was running.